Sure thing! I think informing yourself about the risks of any medical intervention before jumping in is one of the most sensible things one can do, and understanding possible complications during a 10 pass is no exception. What is the 10 Pass method? 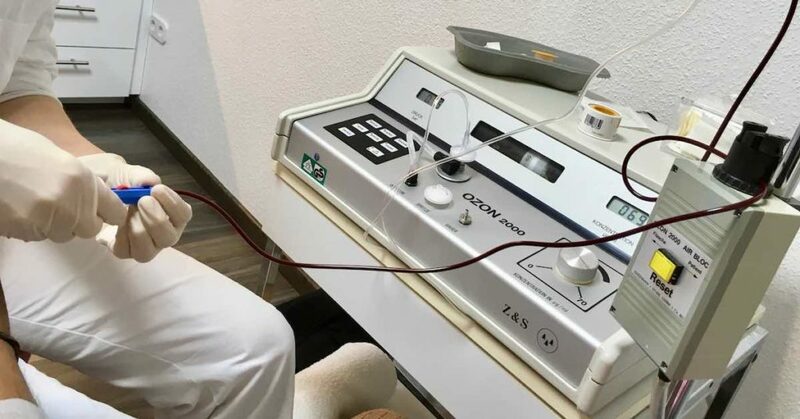 The 10 pass high dose method is an intravenous ozone treatment developed by Austrian gynecologist and surgeon Dr. Johann Lahodny. It consists of extracting 200 ml of blood with the help of a vacuum, mixing it with 20,000 units of heparin and with 200 ml of ozone/oxygen at a concentration of 70 mcg/ml, and re-infusing it back into the patient. The re-infusion happens hyperbarically, which means that it takes place under a small amount of positive pressure of less than 1 bar. This is repeated ten times in a continuous process which lasts between one to two hours. During that time, an unprecedented 140,000 mcg of ozone are used to treat the patient’s blood. Due to the 10-fold repetition it is called the “10 Pass”. Dr. Lahondy prefers to call it the Lahodny I method. The 10 pass method is gaining in popularity worldwide. It seems to have especially caught the imagination and business acumen of US doctors. Unfortunately, due to the novelty of the procedure and the fact that many doctors are not experienced in the use of heparin, patients are often not prepared for the possible complications of this treatment. The procedure often yields surprising results in chronic conditions which years of various other treatments weren’t able to accomplish. Yet, it appears that it does not completely live up to the hype which has sprung up around it. Not only does it not reliably deliver the near miraculous results Dr. Lahodny promises, it also has a number of side effects which everyone should be aware of before undergoing the procedure. The Power Of Ozone Newsletter! The 10 pass is a relatively safe procedure. It is a hyperbaric ozone treatment, which means that the blood is re-infused into the vein using a slight positive pressure of up to 0.8 bar. In order to be able to accomplish this, a special hyperbaric ozone machine is needed. The world leaders in the engineering and manufacturing of hyperbaric ozone machines are the two German companies Herrmann Apparatebau and Zotzmann & Stahl. About 40 years ago during the early development of the hyperbaric machines, one or two fatalities occurred. The deaths led to the implementation of certain safety mechanisms into the modern generators which, if operated by properly trained staff, make such accidents impossible nowadays. Apart from those tragic learning stages — which had nothing to do with the 10 pass method and which occurred decades before Dr. Lahodny came upon the scene — there are no known cases of death during hyperbaric ozone treatments. Compared to conventional medicine, which in the US alone is responsible for up to 400,000 fatalities yearly, the 10 pass is an exceptionally safe method. Like any medical intervention, conventional or alternative, the 10 pass ozone treatment method is not completely risk-free. There are certain side effects which can occur during or after a 10 pass which every patient should be informed about before undergoing the treatment. Common side effects during a 10 pass can be divided into 2 different groups: 1) the side effects which are due to heparin, a prescription drug; and 2) side effects due to the ozone itself, or due to other non-heparin related aspects. The 10 Pass method requires the administration of 20,000 units of heparin. The 10 Pass method cannot be performed without an anticoagulant. An anticoagulant is a substance which ensures that the blood stays liquid once it is removed from the human body. The preferred blood thinner during the 10 Pass is heparin. Heparin is considered a relatively safe prescription drug. Dr. Lahodny even ascribes a therapeutical effect to it. In the past, there were reports of fatalities after heparin administration. Those cases had nothing to do with the 10 pass; it appears the problem was due to a lack of inspections of the Chinese facilities where most heparin is produced. Now, it seems, stricter regulations have been implemented and serious side effects are less common, but still not impossible. Uncontrolled bleeding is still mentioned as a possible serious side-effect in the heparin literature. Everyone considering the 10 pass should also be aware of the following possible scenario: If a heparinized patient becomes involved in a major physical trauma like for example a car accident after leaving the doctor’s office, the patient could experience uncontrolled bleeding. For that reason, Dr. Lahodny instructs practitioners to put wrist bands on 10 pass patients before they leave the practice. The band shows the time and amount of the administered heparin. In the case of an accident, the paramedic can apply heparinase based on the information on the wrist band. Heparinase is an enzyme which neutralizes the effect of heparin and is able to stop the bleeding. Whether this precaution will be able to save a patient in a real life scenario depends on how quickly the ambulance can arrive. So far there are no known cases of patients having become involved in accidents after receiving a 10 pass. Heparin has a half life of around one to two hours. After max 24 hours it should be completely washed out of the system. Brown urine: This is most likely due to the dissolution of blood clots or to some minor bleeding. It is a fairly common occurrence which is in most cases benign. Pain: This is a known side effect of heparin. People, who suffer from rheumatoid arthritis or other joint related conditions should be aware that such could be exacerbated after the 10 pass which does not necessarily have anything to do with ozone. For a complete list of known side effects to heparin, please read here. I highly recommend making yourself familiar with heparin side-effects prior to a 10 pass course. Note: Many of these symptoms can also be observed after ozone applications which do not use heparin, like DIV, ozonated saline, or various insufflations. This results in the unfortunate situation that ozone doctors explain everything that a patient experiences after a 10 pass as an ozone induced detox reaction without being aware that heparin could be, and often is, the more likely culprit. Lack of awareness about the side-effects of heparin on the doctor’s side can create a dangerous situation. If the observed negative response is indeed due to an allergic reaction to heparin, the use of heparin should be stopped immediately. Otherwise, the next 10 pass could cause a life-threatening event. Heparin can interact with a number of drugs. Your doctor should be informed if you take other blood thinners, Aspirin, NSAIDS, antihistamines, antithrombins, and a range of other drugs. Please, check this and this page for a complete list of drug interactions. The big needle and pressure used during a 10 Pass treatment put a strain on veins. A dramatic detox reaction: It can range from pain in places where there was no pain before, to rashes, or to feeling extremely tired, as well as many other symptoms. Any detox reaction which takes place during other ozone treatments can also be experienced during or after a 10 pass, but much more intensely. This includes also triggering oxalate dumping, something which I will talk about in another article. Going broke without seeing much of an effect: A 10 pass costs in some doctor’s offices up to $1,200. A whole course can reach tens of thousands of dollars without a guarantee of improvement. Even if an improvement is realized it is often not permanent, or only minor. In rare cases, the patient can even experience troubling new symptoms which weren’t there before. Inability to perform the procedure because of inadequate veins of the patient: The 10 pass method requires a relatively thick needle of 18g. Since hyperbaric pressure is exerted on the vein, the patient needs to have at least one good vein to undergo the infusion. Not every patient is appropriately equipped in which case it’s not possible to perform the treatment at all. Damaged veins: Even patients who have strong veins can face the possibility that the increased pressure becomes too much over time. This situation can result in a ruptured or “blown” vein with a resulting local bleeding. A “blown” vein is not life threatening. In most cases it heals up without problems. However, the patient cannot continue the treatment, or the treatment needs to be aborted. Sometimes a patient’s vein can only withstand a few passes without reaching the crucial ten, at which the stem cell stimulating effects kicks in, according to Dr. Lahodny. Scarred veins: a blown vein often heals up without complications but sometimes there is permanent damage to the point that the vein cannot be used for any other infusions. The patient remains without a good vein to undergo other important treatments. Lung discomfort: The application of any type of injection which involves oxygen can lead to the sensation of heavy lungs, difficulty breathing, or pain in the lungs. This is most likely due to micro-embolisms. Oxygen needs some time to be absorbed by the red blood cells. It is not an instantaneous process. Since during a 10 pass larger amounts of ozone and oxygen are mixed with the blood, the patient can experience that typical chest feeling. When it occurs, the procedure must be aborted. The delivery of larger amounts of Vitamin C is in general a good antidote and offers quick relief. Clogged lines: What sometimes occurs is that the transfusion line which transports blood from the patient to the vacuum bottle clogs up although it is sufficiently heparinized. This usually happens after a number of passes has already been completed. Dr. Lahodny says this is because of electrostatic charge inside the line. In such a case, the clogged line can be exchanged mid-treatment for a fresh one. An experienced practitioner knows how to do this without interrupting the procedure. An unexperienced nurse or doctor will have to abort the treatment. Ozone therapy including the 10 Pass is one of the safest medical interventions there are, but it is not completely risk free. Before undergoing a 10 Pass familiarize yourself with the list of heparin side-effects, risks, contraindications, and interactions with other drugs. Do not count on your doctor being adequately informed. Study this page. Be aware, that it is often impossible to tell whether what you are experiencing is a reaction to the heparin or an ozone induced detox reaction. Often, only time will tell. Have you received a 10 Pass treatment? Did everything go well or did you experience problems? Let me know in the comments below. This website pro­vides gen­eral infor­ma­tion and dis­cus­sion about med­i­cine, health and related sub­jects. The words and other con­tent pro­vided in this blog, and in any linked mate­ri­als, are not intended and should not be con­strued as med­ical advice. If the reader or any other per­son has a med­ical con­cern, he or she should con­sult with an appropriately-licensed physi­cian or other health care worker. Never dis­re­gard pro­fes­sional med­ical advice or delay in seek­ing it because of some­thing you have read on this blog or in any linked materials. If you think you may have a med­ical emer­gency, call your doc­tor immediately. Join our mailing list to learn about new blog posts and videos. YES, I WANT SOME OF THAT OZONE ACTION! What about people sharing a zottzman machine and the technician accidentally sucking infected blood into the machine beyond the disposal parts and then it infecting the next user? when liquid enters the machine it is damaged and doesn’t work anymore. It needs to be completely overhauled and all parts which came in contact with the blood must be exchanged. Hi Paola, glad to see your still pumping out ozone info. I had three ten passes at Dr. Rowen’s office last year. They were all done within two weeks. My veins were good so each procedure only lasted 1.5hrs. I honestly couldn’t not pin point a specific improvement but know it did me good to clean my blood since I’m always detoxing. Maybe the 10 passes had some prophylactic effect, who knows. thank you for reading! Yeah, let me know how you liked it when you do. Hi, is there Amy info how to do vaginal insufflation? This site is very helpful! My health problems are due to upper digestive disease and associated pain/anxiety. There’s also complications due to EBV and CMV. I started out slow with O3 IV treatments: 4 one passes over 6 weeks, then a 2 pass, 3 pass and finally a 5 pass. All O3 treatments were given over a 3 month period. Although my health improved dramatically, the associated increased energy was a real problem for me. I’m already a very high energy person (even at 60 years old) so the 5 pass was too much for me. It stimulated a response of extreme sweating (including night sweats) and I got dehydrated and had to get a couple of liters of hydration IV. Since then I’ve stopped getting IV O3 and have ordered all the equipment I need to do VI’s THANKS TO YOU! …and thanks for the coupon code for Promolife. I hope you will like the home treatments! Hi, do you have (or could you recommend) a code of practice document for a medical professional considering Ten Pass Ozone treatment on patients. I am not aware of such a document … So, no there is nothing I can recommend. Is it common practice to administer I.V. ozone and then immediately following go ahead with high dose I.V. vitamin c ? This would be as a treatment for lung cancer. I think it’s quite common. I still don’t recommend it. Best is to let a few hours pass after the ozone IV to allow the ozone to fully enfold its effect. Only then do the Vit C IV. Otherwise the antioxidant capacity of Vit C will likely negate at least some of the ozone. hi paola how good you explain all this. I made 5 ten passes so far. I have a history of candida, urinary and irritable colon. The first 3 sessions filled me with energy and I was fine, I prepare with Bouloke and yes. genetically I do not have an effect on the war, but I do not know exactly if I am allergic to heparin, we could say what life is allergy and food intolerances. But hey, the passes 4 and 5 have been stronger I get a lot more inflammation of belly and gas that brought me an attack of irritable color. How would I know if I am allergic to heparin? 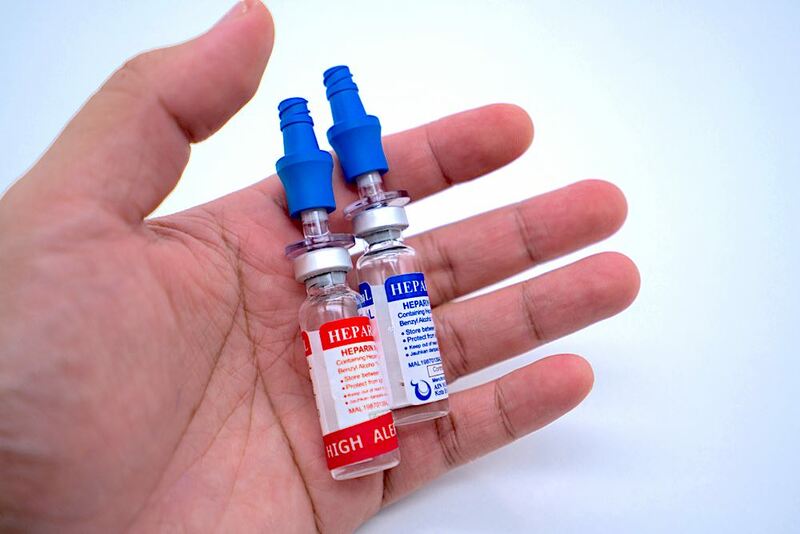 Heparin allergy can be checked by injecting a very small amount of heparin intradermally and observe if there is a reaction to it. If there is, that makes an allergy likely. Your doctor should know more about it, though. I just did my 4th 10 pass treatment. Aside of minor fatigue and one major headache the day after my first 10 pass – all was good. However, I am now sick with a cold. clinic keeps telling me it is a detox symptom, but I don’t know if this is so. It is full blown REAL cold that is now lasting me over 5 days. I can feel that it had gone to my chest. I am coughing green phlegm, sneezing, stuffy nose, have to blow my nose often, feeling very lousy, just like the common cold. I find it hard to believe that this is detox, as i was also around a sick person last week who had many cold symptoms around me. I was told that while on the 10 pass protocol I couldn’t get “sick” as I am “kicking stuff out” and it is impossible to “get stuff” in. But being that I feels o horrible and my child also has symptoms of cold now, I find it hard to believe it is detox. What are your thoughts? can someone catch a virus while doing the 10 pass? I was diagnosed with Lyme and many other microbes and intend to implement this treatment until it is all gone. And by the way- I was told that if I stick with ALL the sessions necessary, take my supplements, and be on the keto diet for weeks- that it is “guaranteed” that I will be completely cured of everything I have. from what I read in this article it seems like it is not the promised solution. 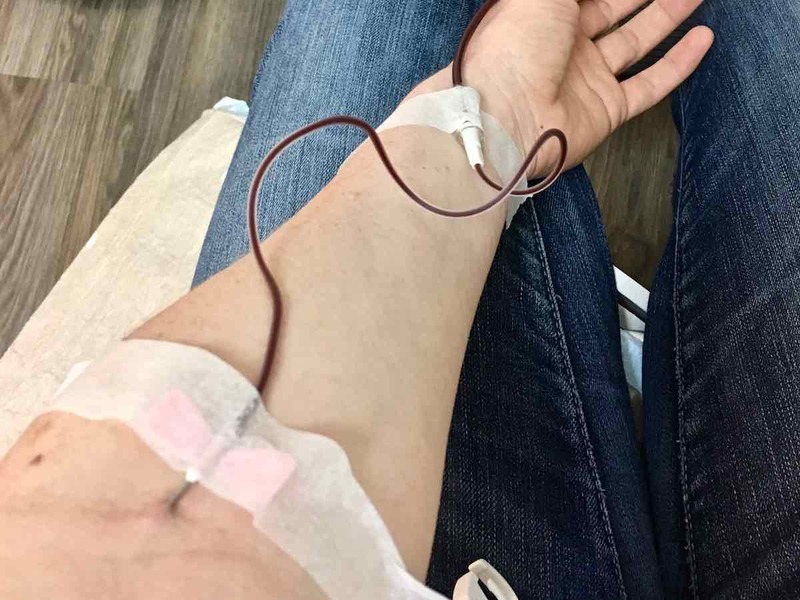 The treatment is very expensive although not as bad as other clinics ($700) for 10 pass, $250 for PK protocol-for lyme, $130 for vitamin/mineral IV bag, glutathione and more. My average bill when i go in is at the bare minimum $1100. I am I fooling myself and wasting hard earned savings? it seems that you came across some quacks. Of course it is possible to catch a virus or a bacterial infection while getting the 10 pass. Just because one gets treated with ozone doesn’t mean that a) the treatment has already unfolded all its immune boosting effects, b) was maximally successful in your case, c) makes you invulnerable. To suggest to a patient what you’ve been told, is very misleading and shows lack of competence and seriousness of the practitioner. So, yes it could be detox, or it could be an infection you’re dealing with. In either case, I would continue the treatment. If it’s an infection, that’s when you need ozone the most, if it’s detox, it could be a sign of healing. So, regarding your ozone treatment it’s really irrelevant what you’re dealing with right now. Since whatever it is, it would be a good idea to keep doing ozone in all likelihood. But regarding your practitioner it tells you, you’re dealing with someone who is clueless or is misleading you. Another strong indication that you’re dealing with a quack is the word “guaranteed”. There is no such a thing in health care, be it alternative or conventional. There are a few things that a doctor or therapist can say that are unmistakable signs of a quack. Issuing a guarantee to a patient is such a very strong sign.